Brinicombe Equine Think Laminitix Granules is a concentrated formula which provides essential ingredients to support healthy hooves, while a selection of natural nutritional aids support a stable metabolism, blood sugar level and digestive system. During the spring and summer months particularly the sugar content from grazing is increased which can cause complications like Think Laminitix provides the best nutrition for maintaining circulation and soundness, and metabolic equilibrium at the times when your horse needs it most. Magnesium phosphate, lithothamn, lucerne, methy sulphonyl methane, potassium amino acid chelate, magnesium amino acid chelate, mineral oil, colostrum. All horses and ponies who are at risk to laminitis, particularly during the periods of increased grass growth (Spring/Autumn). There is an initial loading rate with this product for the first 4 weeks of feeding. 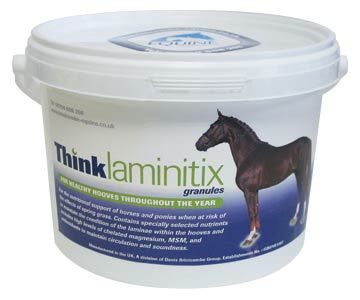 There are currently no questions for Brinicombe Equine Think Laminitix Granules for Horses - be the first to ask one!